A weird thing happens when you travel. Sometimes you see a place so beautiful, it’s difficult to believe that people actually live there — that it’s not reserved solely for the immortal among us — those with Herculean blood or some other divine privilege. And sometimes you see a place so desolate and deprived of natural beauty, it’s difficult to believe that people actually live there — that’s it’s not reserved solely for those banished into exile for the most heinous of crimes. And sometimes — sometimes — you discover a place where you can’t help but imagine living yourself. 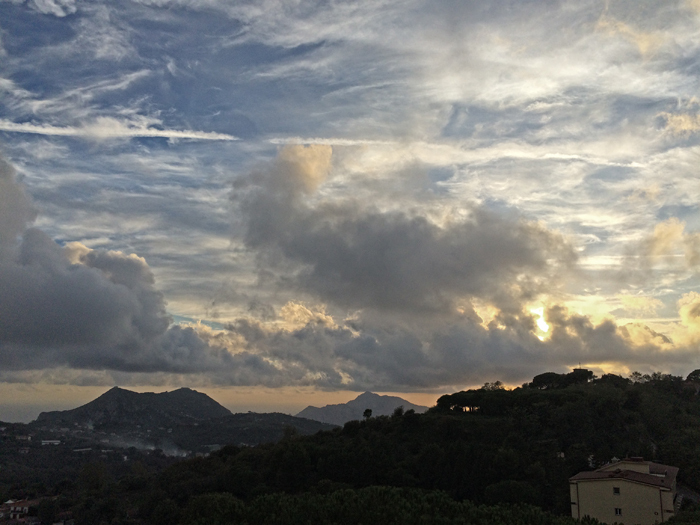 And now it’s happened in Sorrento. Jessica and Alaina in Sorrento. So why this city? Why not Positano, with its striking cliffside beauty? Why not New York, with its restaurants and culture and energy? Well. I can’t say for sure, but I’d venture to guess it’s a perfect storm of size, location, climate, and an intangible feeling akin to warm fuzzy socks in winter or the shiver that runs up your spine when you sit down to an al fresco lunch with a great glass of wine and even better friends on a perfect 75-degree day. You know that shiver — it happens during the moments when you can’t help but smile at your absolute fortune. 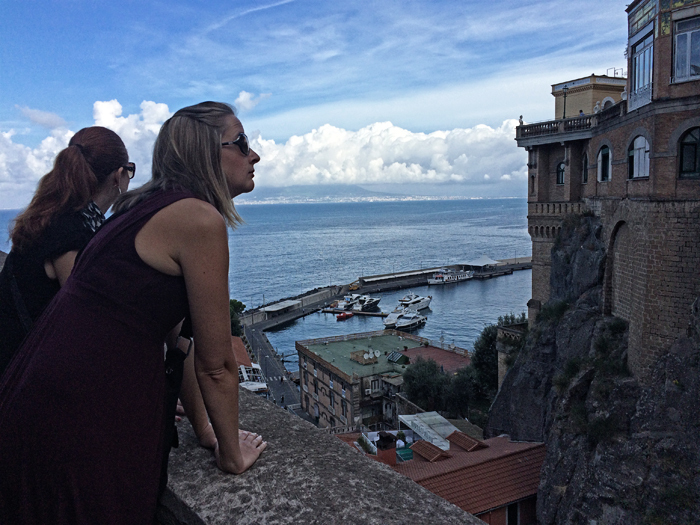 We’d stopped in Sorrento on Day 4 for some gelato on our way back to the hotel, and immediately our group knew — this is where we all wanted to spend our free time on our final day of The International Kitchen‘s Women-only-Week Mediterranean Cooking Experience. Splitting cab fare 6 ways made the 45-minute ride from Sant’ Agata mostly affordable, and when we arrived, we immediately sat down to a cappuccino in an open-air diner in the middle of the Piazza Tasso, and I felt it. 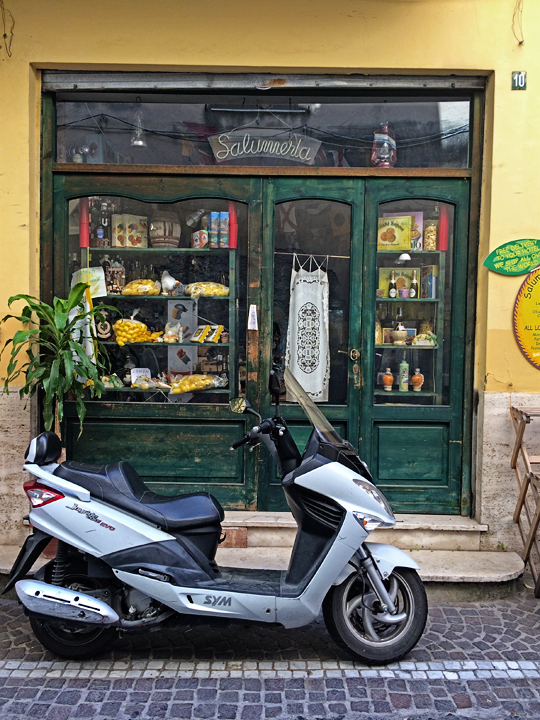 Sure, there are a lot of shops catering to tourists — places where you go to buy all things lemon (limoncello, limoncello-flavored candies, and lemon-shaped serving dishes), inexpensive scarves, and those Positano linens at an affordable price. But it wasn’t too posed. Not too touristy. 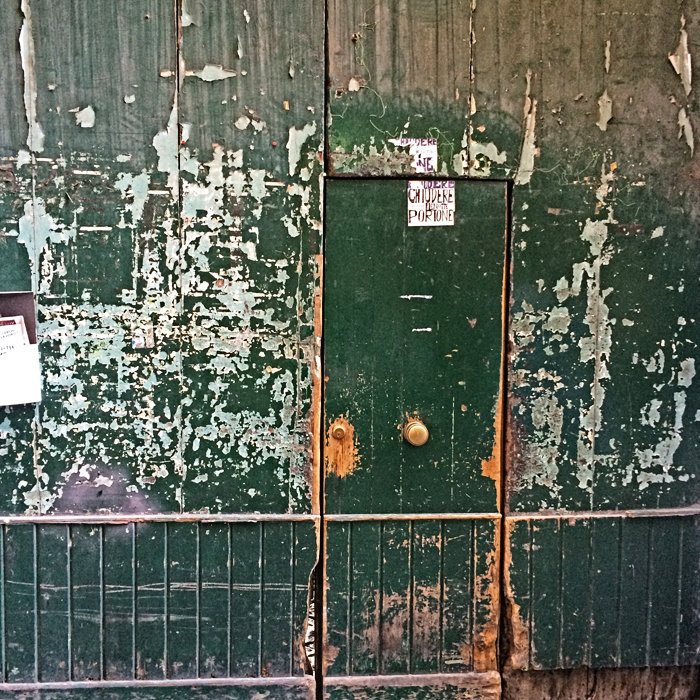 Where the paint is rubbed raw from so many passing fingers, the city’s true patina is allowed to shine. 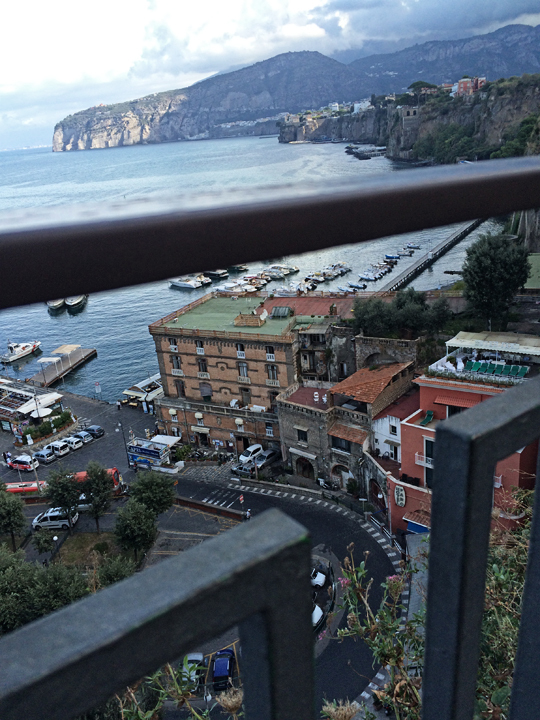 Sorrento is a small-ish size, with a population of less than 20,000. 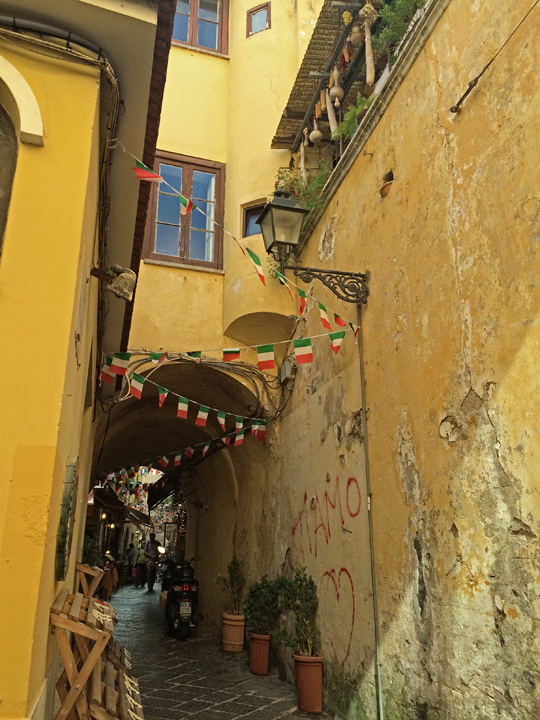 The city is walkable (filed with scrumptious winding nooks and crannies) and relatively flat, which is surprising considering how it butts against some seaside cliffs and crouches beneath the mountains of the Sorrentine Peninsula. From its main port, it’s easy to get ferries to Naples, Capri, and towns along the Amalfi Coast. The mild, Mediterranean climate doesn’t hurt its appeal any, either. 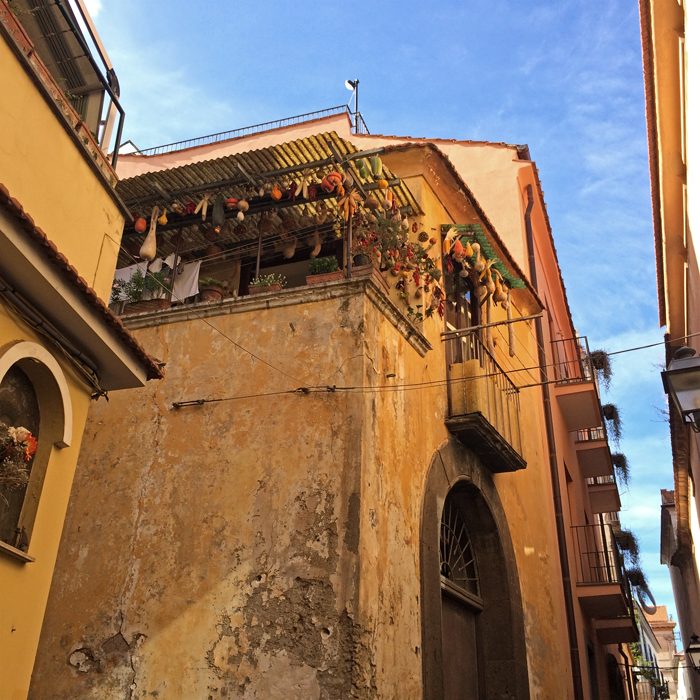 Imagine everything I loved about Malaga — the Mediterranean breeze, olives, wines, and brilliant colors — combined with the Italian flair for espresso, art, and pasta. Even better, the people there seemed friendly. I didn’t sense an underlying air of annoyance for the tourists, but instead a local pride, as though each business owner and craftsman wanted to tell us, Here! This is what I can do. Let me show you. And show us, they did. My friend Alaina, who has a penchant for wandering, wandered us right into a quiet alcove that, during the busy midmorning hours, seemed far too empty to be public. 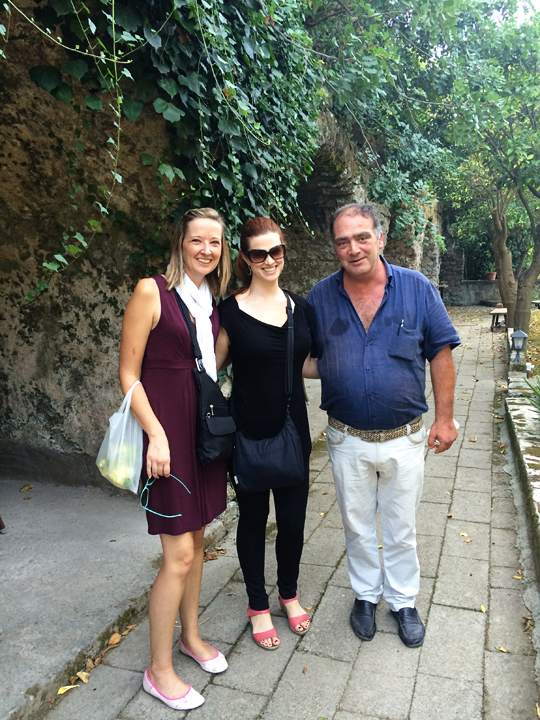 A fuzzy Italian man came rushing through and with hardly a pause, said, “Would you like to see my garden?” Alaina shrugged and fell into step behind him, so Jessica and I followed, half-suspecting we were about to be sold to the Italian mafia as drug runners. 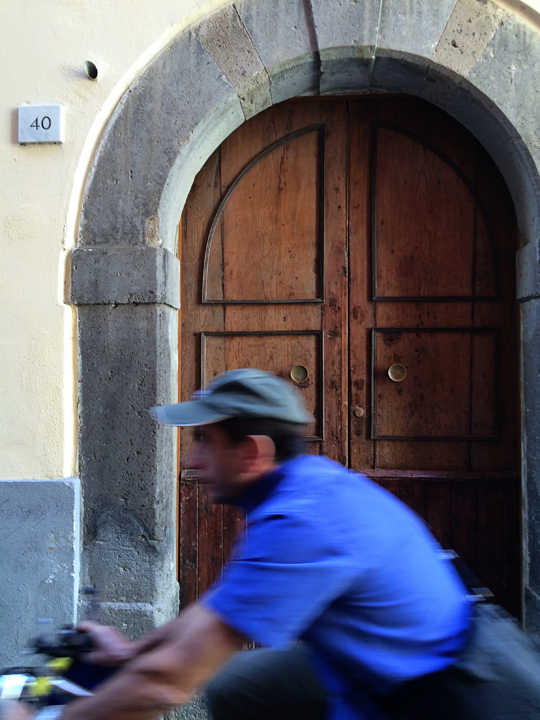 Fortunately, it turned out that he was the owner of a restaurant called I Giardini di Tasso, and it was the entryway to his restaurant through which we’d been wandering. He led us up a wide flight of stairs where we emerged into a large solarium, of sorts, with several tables and a bar. 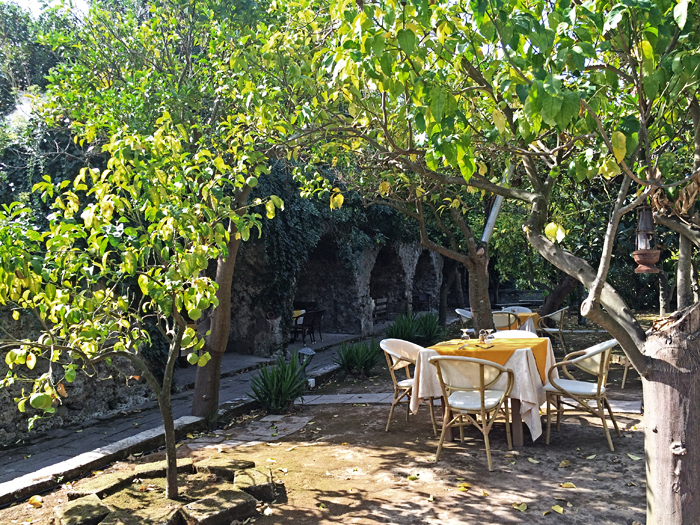 He then led us through to his “garden,” which was a verdant oasis in the middle of the city with dangling vines, gnarly lemon trees, and medieval Roman archways. 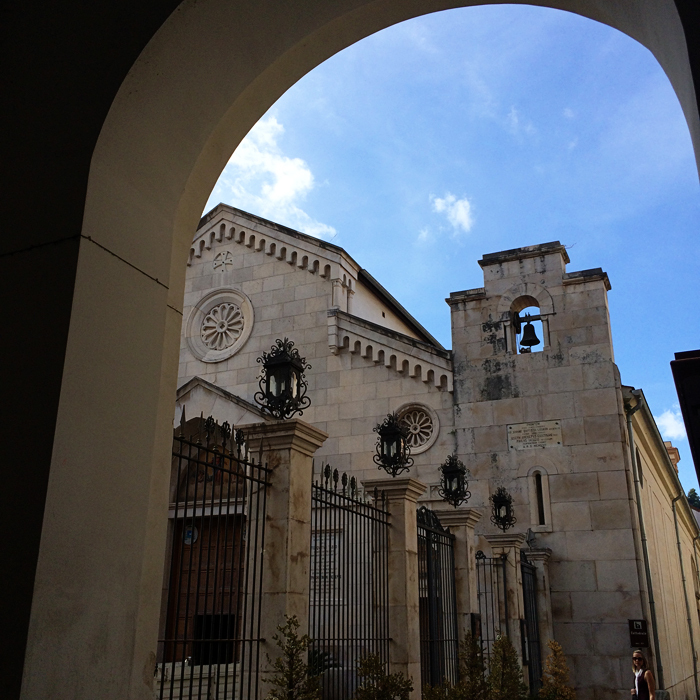 We were told those archways were the real deal. 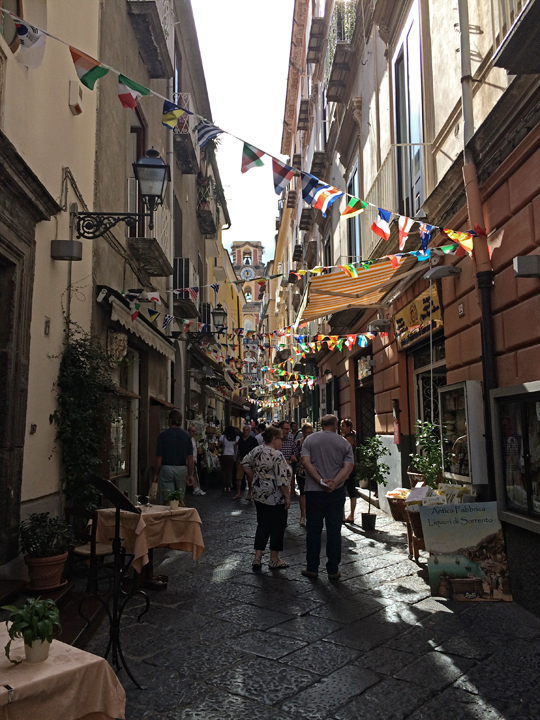 This tourist-friendly attitude is a huge part of what I loved about Sorrento, and should I ever find myself in southern Italy again, I intend on heading back to I Giardini di Tasso to have a meal. On our last night at the Oasi Olimpia Relais, my glass of wine encouraged me to climb the stairs to the roof. I’d expected there to be a view. 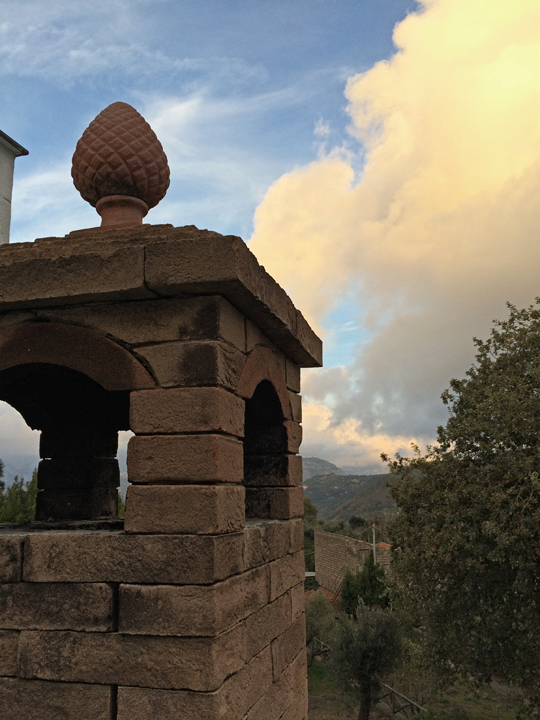 Or of both gulfs — one on each side — from the top of this little hotel perched at the crest of the hill. “The Oasi Olimpia is a very special place,” Richard from The International Kitchen had told me before I left. And while I was sure it would be nice, the way views of Mount Vesuvius and wine on the veranda is nice, I realized that Richard was right from the moment I walked in — this place wasn’t just nice. It was special. The way warm fuzzy socks in winter are special. If I could change anything about this tour, the list would be small: Perhaps a bit more time at Pompeii, or maybe an entire day on the coast without rushing back to cook — but really, as far as week-long tours go, the pace, tone, and activities on this one were very nearly close to perfect. And now, as winter approaches here in Virginia and I’m wearing those fuzzy socks for real, I find myself perusing through some of The International Kitchen’s other destinations. Greece? Portugal? Turkey? Africa? Because, really. This wasn’t just a tour — it was an experience. One I’d trust Karen and her team with again and again. 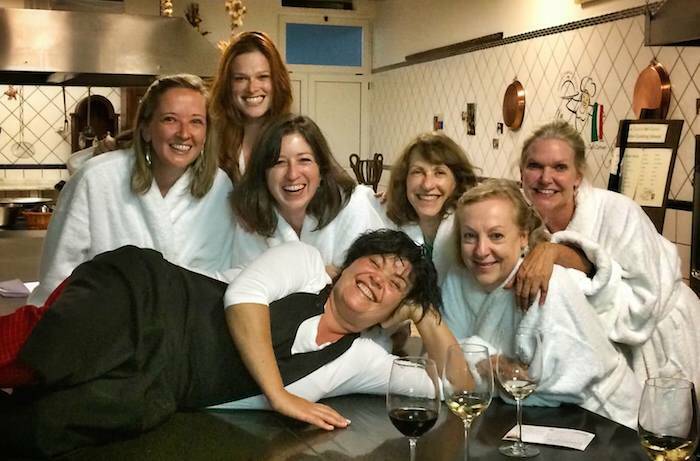 It just doesn’t get any more special than bathrobes in the kitchen of a 3-star hotel. If your luggage doesn’t happen to be lost, bring comfortable clothes and shoes for the cooking classes and excursions. Portugal sounds good to me! Now that’s my kind of vacation. I’m fairly certain I would have feigned losing my passport for a month or three. I love the idea of what it means to live somewhere, and why a place speaks to us in this way (or not). 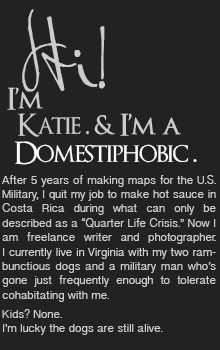 Maybe you would like to contribute to this feature I have on my blog “I Could Totally Live There”… it’s a really simple interview meant to be quick and fun. This place would be perfect! Ooh! I would love to do that! 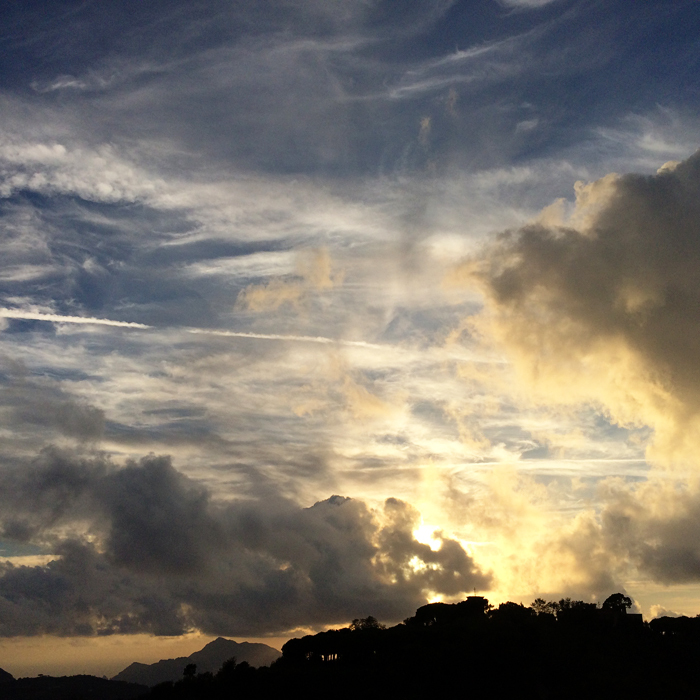 Though as much as I loved Sorrento and Italy, I’d maybe pick Malaga — or even Ibiza — in Spain for that interview. Would that work? 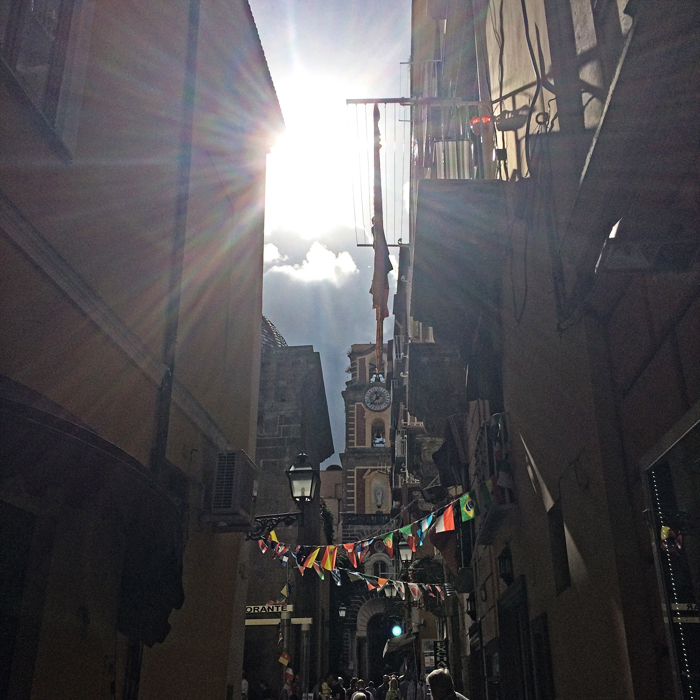 Oh Italy…there is so much to experience. I have not been to any of these areas and am now bugging the hubby about the next Italy trip, we really have a lot of ground to cover. I have glossed over so many places, your trip has really opened up my eyes to other locales – which is one part exciting and one part depressing (so many places to experience in the world). Italy has always been one of my favorite places to visit – I have an affinity for France and French things, but Italy has many of the same things I love about France, plus happy people! I’m moved. Really. 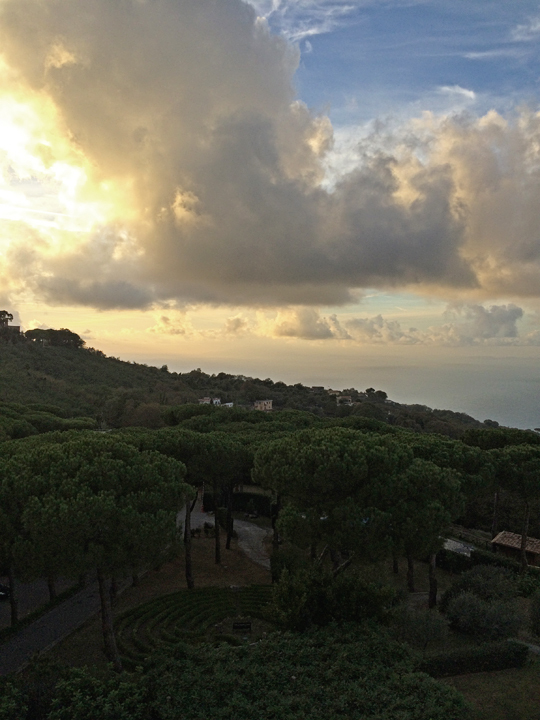 From the first paragraph you grabbed me and I was IN Sorrento, sharing the feel, spirit and beauty. Thank you for the brief escape. What an amazing tour. 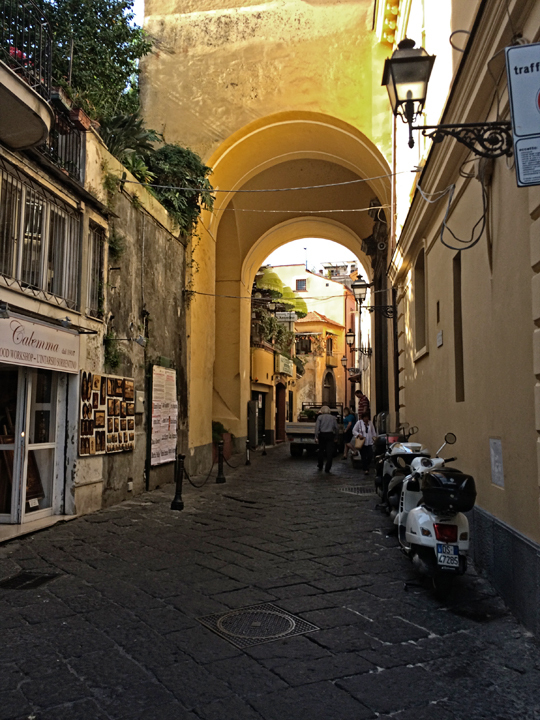 I agree with you….love, love, love Sorrento….I guess because it feels like the most real city on the Amalfi Coast – – yet – – it is ON the Amalfi Coast! Glad you enjoyed…. Wow, those sunset views are spectacular! 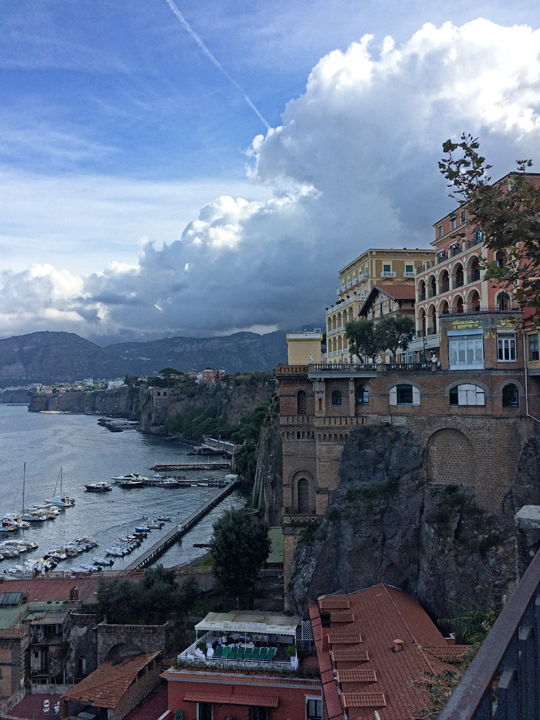 I’ve never been to Sorrento, but I have had that feeling of being completely able to live in a place that you describe so well. It seems to happen to me in big cities, like Berlin and London. yes! You are TOTALLY correct…it is not on the coast….I guess I just consider anything in that area “Amalfi” – – – even Capri….which is an island all by itself…ha, ha, ha….still….it is a great town….